Oh, my God! Wow! This books sounds so interesting, and I need to add it to my TBR. I am looking forward to reading it, which is why I only skimmed through your review. And in any case, you fulfilled the purpose of making me curious for this read! Wonderful review, Keertana! I'm really glad that you ended up loving this one too Keertana. When I went to Leigh's talk last year I was a little wary about how she would make so many different perspectives work, but of course I was able to devour every single page. I loved how Bardugo kept us on our toes throughout and of course I was routing for one romance from the very beginning, but loved the other ones which emerged too. I can't wait to be back with this fantastic world again soon. Lovely review! Wasn't this book just absolutely amazing?! I never watched OCEAN'S ELEVEN either, but THE AVENGERS is a pretty good comparison, to be honest! I can see where you're going there! But I just want to reiterate your point - the multiple POVs were written so, so amazingly. So many authors fail in this department - I mean SIX POVS?! - but Bardugo really kicked the bar high. It would be so hard not to compare heist books with multiple POVS to this masterpiece now. I haven't read my copy yet, but you sold me on the romance! I have this one waiting for me at my library. I just need to ask for it. YES! Oh you got me with the first one, but you gave me 6 and I need to get through my other review books so I can get to this one. I cannot wait! I am also thrilled that her multi-POV works. It is so great when it works. Yep, need to get to this one sooner than I would have otherwise. See what you do to me? I SHIP ALL THE SHIPS IN THIS BOOK KEERTANA!!!! Allllllll of them. I loved the seeming impossibility of one pair, the anger and hurt of another, and finally the unexpectedness of a third (I WANT MORE!). "though I usually shy away from multiple perspectives, Bardugo perfected it." Completely agree! Normally more than two POVs makes me pass on a book because inevitably I develop a preference for one or two and then resent having to spend time with the others, but that was not the case here in the least. I loved everything single one of them. I definitely don’t need any more reasons to pick up Six of Crows. You made me even more excited about this book. I always on the lookout for books with multiple POV, though many of them ended up disappointments. I love the sound of romances and I can’t wait to meet these villains. Fantastic review, Keertana! 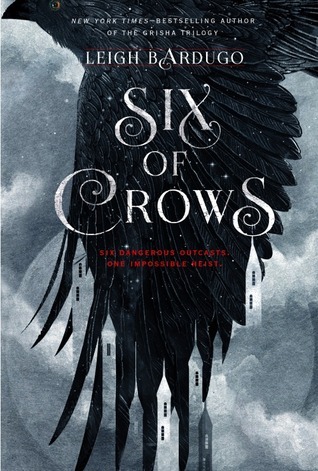 SIX OF CROWS is stunning and lush and complex and astounding. And with a daring and treacherous heist, extraordinary feats of strength, courage and bravery, a skilled crew of cunning and clever thieves, deceivers, schemers, a heavily guarded fortress, a heartbreaking sacrifice, a double-cross, and the promise of even more to come, it is a read that is guaranteed to be indescribably awesome. I have been so eager to read this book and even more so after reading your praise! I was a little hesitant because I had previously read of the numerous POV's which don't usually work for me but I'm pleased to read it was done well. Gah this book sounds epic, I need this in my life. So planning to read it by the end of november, just need to make some time. It looks oh so good. A heist? Great Villains, awesome characters? this book is packed with stuff. Did you know you can shorten your long urls with AdFly and receive dollars for every click on your shortened links.